I have a problem which I can't seem to fix. My task is simple : I want to connect to the machine in our network which is an used IBM Server and has SQL running on it. I am using the Microsoft SQL Server Management Tool and I have set up a Database with the name "hgadb" for test purpose as well as a Login for that database with the username hgadbuser and the matching password. Die Standarddatenbank des Benutzers kann nicht geöffnet werden. Fehler bei der Anmeldung. 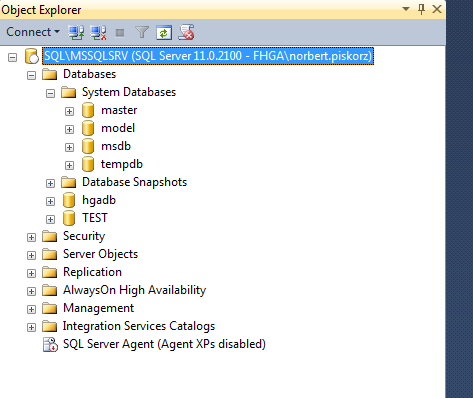 When I login with windows authentification and change the database the user is trying to connect to to the "master" database in the folder system database (as seen on the picture below), then i am able to connect to that one with SSMS and my php connection doesn't show any errors. Why can't I connect to one of my test databases? I had to set Permissions for the Database in SSMS for Guest and Public connections. Now it works properly. Not the answer you're looking for? Browse other questions tagged php sql-server ssms windows-server-2012 or ask your own question.